He was a student-athlete at the Loyola University in Chicago during 2000/2001 academic year. He graduated from Nicolas Copernicus University Law and Administration Department in Torun, Poland in 2005. He is an alumni of Summer Programme in International Sports Law: The expanding area of Sports Law held by Asser International Sports Law Centre in The Hague, Netherlands in 2013. He is a Ph.D. candidate at Chair of Criminal Law at Law and Administration Department of Nicolas Copernicus University. He was a professional basketball player between 2001-2014. He played for the Poland national basketball team during in 2004 and 2005. He has been working as a basketball expert for Canal+ Sport TV channel since 2007. He has been a member of International Association of Sports Law in Athens since 2005 as well as Polish Sports Law Society in Poznan since 2013. He has been a lecturer in sports law at Sport Management Programme run in Warsaw, Poland and organised jointly by Kozminski Academy, PL.2012, FIFA and International Centre for Sport Studies (CIES) since 2014. 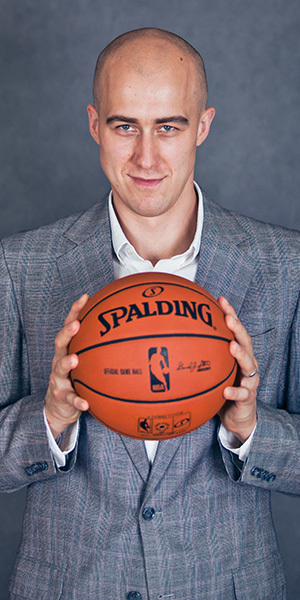 He has been a legal consultant of basketball agency Limelight Hoops based in Berlin, Germany since 2014. He is an author of numerous legal publications in sports law. He has been a panelist at many conferences about sports law. He gave multiple media interviews regarding sports law and sport management issues. In his legal practice he focuses on representing professional athletes, coaches and advising to sport organisations.